I believe that economic equity and academic excellence are two concepts that educators almost universally support. In a world seemingly awash with inequity–especially racial and economic—equity sounds like just the right tonic. At the same time, academic excellence is education’s gold standard in our classrooms and buildings. We all want to produce excellent students. For us at the International Center for Leadership, excellence means preparing students to become financially self-sufficient and responsible citizens in a fast-changing world. As the son of a 97-year-old father who lives primarily on Social Security, and as a father of a severely disabled daughter, I am thankful for Social Security, Medicare and Medicaid. I am also grateful that my wife, Bonnie, and I can help support them. But this has taught me an important lesson: Equity is expensive—really expensive! Which leads me back to education. This country simply cannot support economic equity unless we also experience economic success–and we cannot experience economic success unless we have relevant academic success. We’re falling short. Rapidly changing technology, combined with a changing workplace, has redefined what relevant academic success means. What worked in the 20th century doesn’t work 16 years into the 21st century. But as many of us know, most schools still operate on a 20th century model. As I note in my new book, Making Schools Work: When CollegeReady Isn’t Ready Enough, new technologies have displaced tens of thousands of factory-basedjobs. Half the jobs lost in the Great Recession paid between $38,000 and $68,000 a year. Today, only about 2 percent of the jobs we’ve regained since 2009 pay in that range; about 70 percent pay below that range and about 28 percent pay above it. Whether you support economic equity or academic excellence, you probably realize that both begin with relevant academic skills. 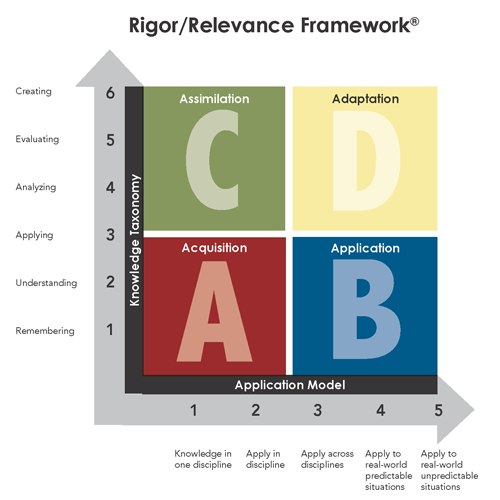 Quadrant A represents simple recall and basic understanding of knowledge for its own sake. Quadrant C embraces higher levels of knowledge. Quadrant B is the application of basic knowledge found in Quadrant A.
Quadrant D is the application of higher-order knowledge found in Quadrant C.
To develop a 21st- century education model, we must start by moving our schools from the A/C quadrant to the B/D quadrant. That means getting students ready to be able to work and effectively function in our changing world. It means we must shift away from teaching and a move towards learning. It means educators should start asking this crucial question: What can students actually do? Specifically, we must prepare students to apply increasingly sophisticated knowledge which technology cannot do. This won’t be easy. It will require a fundamental shift in how we organize our schools, deliver instruction and evaluate our students. But it will be worth the effort. I want equity and excellence for ALL!